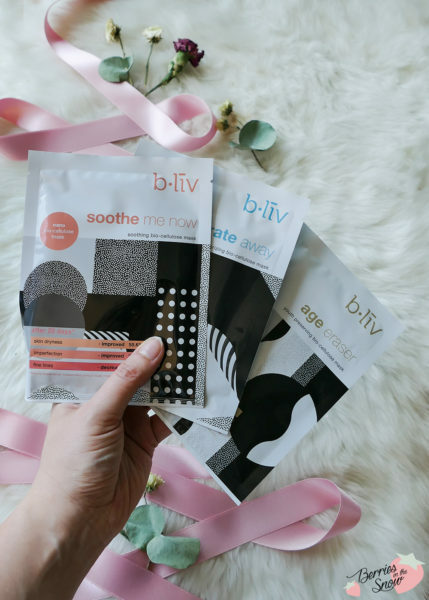 Bliv or b.liv as it is written is a kbeauty brand that appears occasionally in my feed on Instagram. 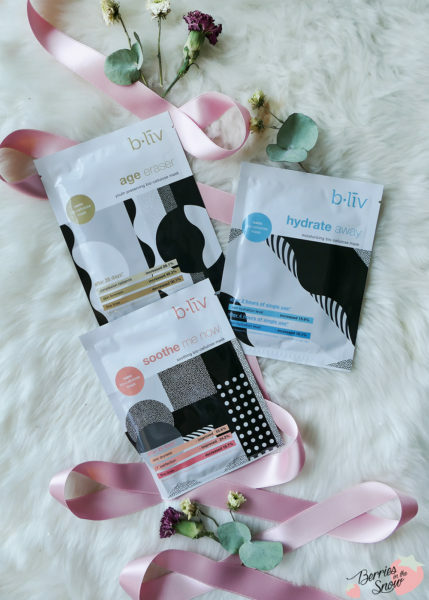 I never tried any of their products before, but their saying is “healthy pores, healthy skin, when you believe (b.liv), you shine with confidence” and you can check out their web page and their products on www.bliv.de. By the way, the name is pronounced as “believe” and was founded in 2009 derived from a cosmaceutical brand. According to their page they are the leading brand for pores management solution. 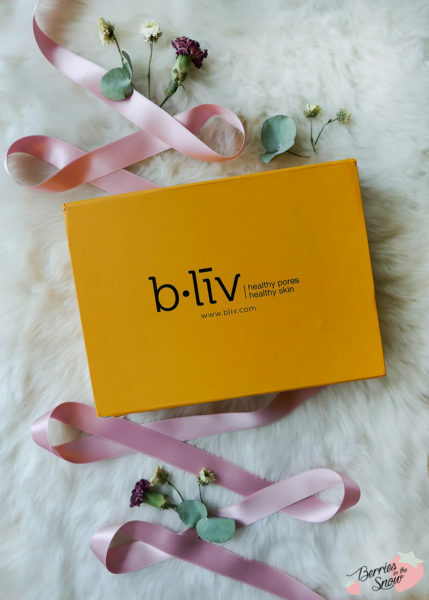 The masks that I kindly received from Bliv for reviewing purpose came in a cute yellow box. 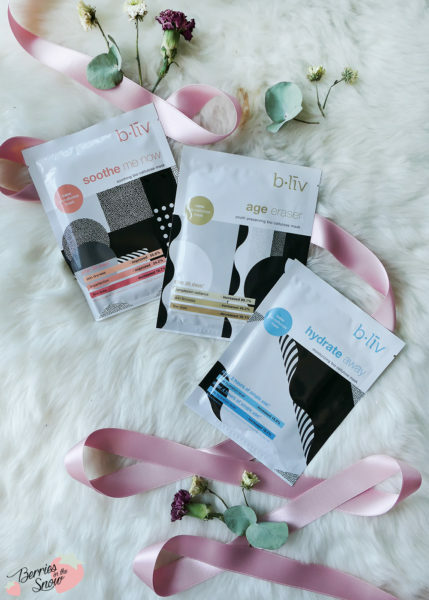 I received the Bliv Nano Bio Cellulose Masks Hydrate Away, Age Eraser, and Soothe Me Now. The packaging design of the masks is modern and a mix of geometric patterns and a specific color of the fonts for each type of mask. 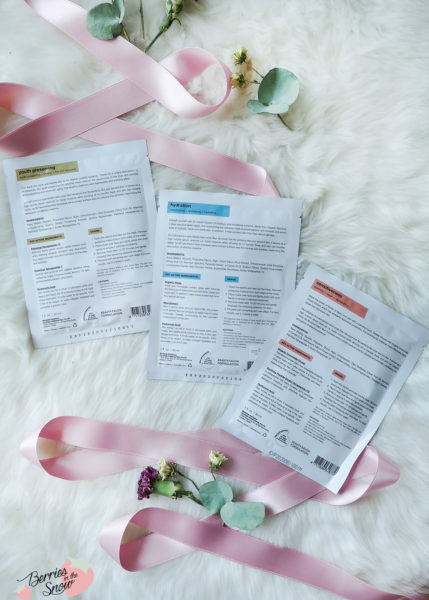 This mask is designed for moisturizing, revitalizing and hydrating made with key ingredients like organic algae, rice extract, and hyaluronic acid. Algae extract is laden with minerals and amino acids and helps to even out skin tone, clarify and repair the skin. In addition, it also helps to protect the skin from free radical damage. Rice extract is rich in amino acids and pro-vitamin b5 and has the property to keep hold of water molecules. Thereby, it contributes to the moisturization of the skin.Hyaluronic acid is a lubricate and keeps skin layers full of moisture It holds water and therby keeps collagen hydrated and promotes a youthful look. 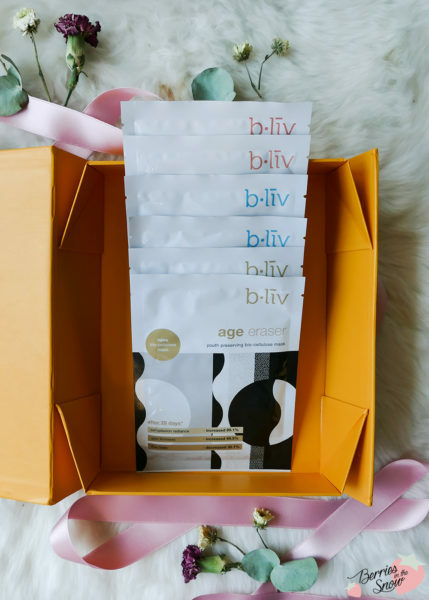 This mask is designed for soothing, repair and rejuvenating the skin using key ingredients like organic immortelle flower, Acetyl Tetrapeptide-15 (also called soothing peptide), and hyaluronic acid. Immortelle flower is a mediterranean plant that has remarkable longevity. It is known to be more soothing than chamomile, and more regenerating than lavender. Acetyl tetrapeptide-15 is a peptide that helps to increase the skin’s sensitivity tolerance threshold and effectively reduces the sensation of discomfort. This mask is designed for youth preserving, firming and reduction of fine lines. Key ingredients in this mask are Palmitoyl Hexapeptide-12, Palmitoyl Tetrapeptide-7, and hyaluronic acid. Palmitoyl hexapeptide-12 acts like botox, relaxing visible tension lines while relieving stinging sensation and discomfort. Thus it helps minimize the long-term formation of fine lines and wrinkles. Palmitoyl tetrapeptide-7 soothes and protects skin against oxidative stress. 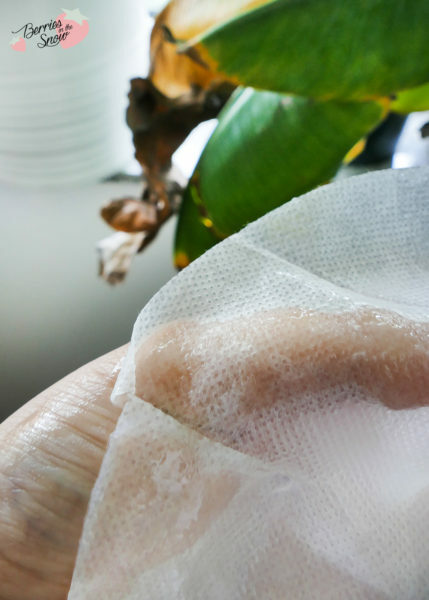 The mask sachets are filled with a lot of essence and you will find the folded bio cellulose mask inside. The mask is folded between two layers, but unlike most other masks it is NOT lying between two plastic foils. One layer is a tulle fabric, and the second one os a cotton like fabric. It was really a unique experience for me to see that. 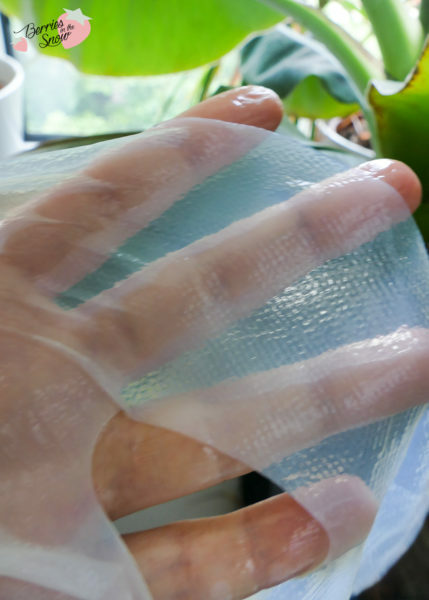 The bio cellulose mask is a specialized nano scale fiber structure with a pattern. 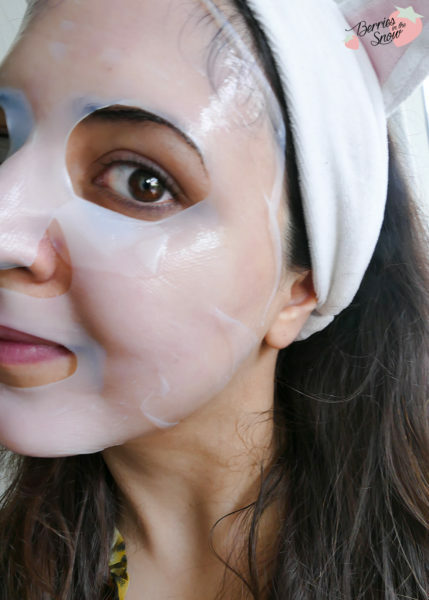 It makes it adhere better to the shape of your face and allows to hold more moisture inside, too. Still the skin is supposed to be able to breathe through the bio cellulose layer. As you can see in the pic below the mask is thin and you can see through it. 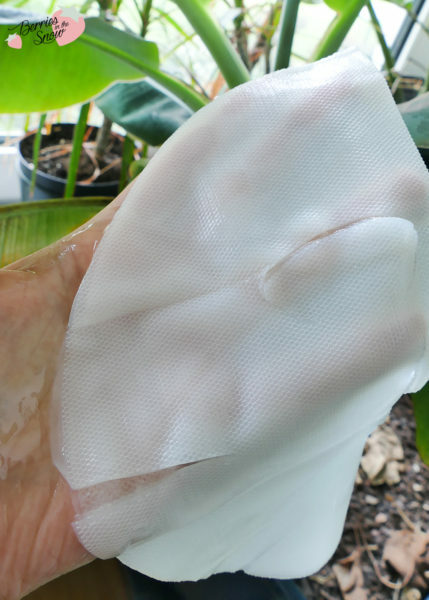 The bio cellulose has the texture of a gel and feels very cooling and refreshing when applied to the skin. It clings perfectly and doesn’t slide around. All the masks were very moist and hydrating while wearing them for 15-20 minutes. The skin feels more bouncy after wearing them. It is hard to say what the differences were between the single masks with only two masks from each type. According to the studies that are listed on the front of each mask there should be a difference when used for a longer period of 28 days. For the Hydrate Me mask the effects are even noticeable after a couple of hours. Since I don’t have any device to measure the moisture content I couldn’t make any studies for myself. 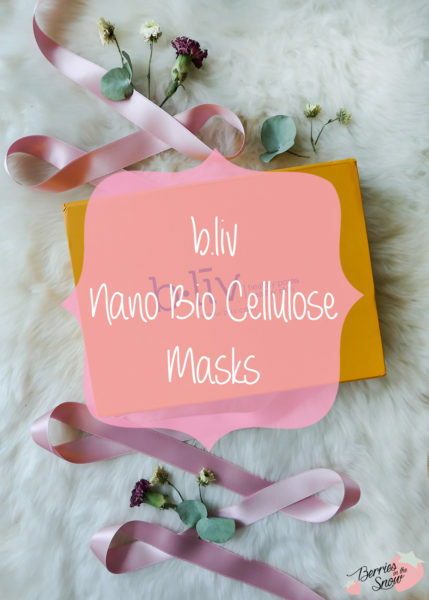 All in all, the Bliv Nano Bio Cellulose Masks were very comfortable to wear and they fitted perfectly and stayed on place as I expected from a bio cellulose mask. I loved the rich amount of essence inside each essence. Also, I think it is nice to point out that Bliv has a money-back guarantee. For the masks you can return the product within 14 days with receipt and left over portion. The masks come in boxes containing 4 masks each and they retail for 35 US$, which is a bit pricey in my eyes, but if you buy 2 boxes you will get 50% off, which is a nice offer for someone who wants to try the masks for a longer period of time. Just as a short reminder: All products mentioned and reviewed on this blog are of my personal opinions. This product here was sent to me for reviewing purpose by https://www.bliv.com/ which doesn’t influence me in providing my honest opinion on the products. Oh ja, ich finde auch dass das ein tolles gefühl ist. Die masken hier sind echt toll!